Experience the beauty of Fall in the Rocky Mountains. Travel north to Boulder, home of the University of Colorado, health food, and mountain climbers. Drive through beautiful and rugged Boulder Canyon and see Boulder Falls. Stop for a coffee or pastry in Nederland before continuing on and experiencing incredible Rocky Mountain scenery on the Peak to Peak Scenic and Historic Byway. Witness large stands of colorful aspen trees and majestic views of the Indian Peaks Wilderness Area and Rocky Mountain National Park. Stroll around Lily Lake before visiting the mountain village of Estes Park, enjoy lunch on your own and explore the multitude of souvenir shops along Fall River and Elk Horn Ave. Observe a variety of wildlife including herds of grazing elk. Your day will begin at Historic Union Station in Downtown Denver where your driver/guide will pick you up in a clean White Ford 12 or 15 passenger touring van at 8:25 am. You will then begin your tour as you head up to the Picturesque town of Boulder. You will pass through town on your way up into rugged Boulder Canyon. While in the canyon you will make a brief stop at beautiful Boulder Falls for pictures and to stretch your legs. continue up the canyon to your next stop, Nederland for a optional restroom, coffee/pastry break and to breath in the fresh cool mountain air and take in the sights. Next you will continue along the beautiful Peak to Peak Scenic Historic Byway where you will see breathtaking views of incredible Rocky Mountain scenery. Enjoy viewing large stands of colorful aspen trees and majestic views of the Indian Peaks Wilderness Area and Rocky Mountain National Park. Observe a variety of wildlife in it's natural environment such as herds of grazing deer and elk. Wildlife viewing is likely but not guaranteed. 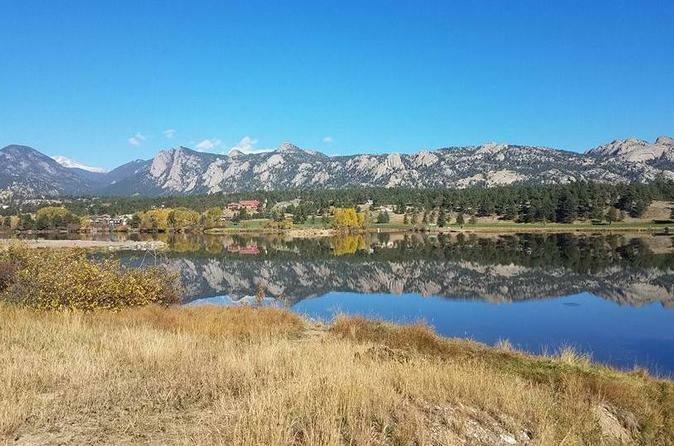 Go for an optional stroll around beautiful Lily Lake that sits at the edge of Rocky Mountain National Park before visiting the quaint mountain village of Estes Park. While in Estes Park enjoy lunch on your own in one of the many restaurants or spend time shopping on main street in the artisan and souvenir shops along the river. You will then return back to Denver and Union Station at approximately 3:30 pm where your tour began. This wonderfully scenic mountain tour is a fantastic way to See, Learn and Explore the beauty of the fall colors in the Rocky Mountains.